innovative digital materials and products. The Micro Format Imagination Gallery contains a limited number of special ink jet coated materials for use in Color Ink Jet Printers. Micro Format is serving the nation with Document Security Paper Products. as a growing market for which Micro Format has unique qualifications. Micro Format offers unique products and services to a number of niche markets. has been a business forms industry leader for almost three decades. (formerly The National Business Forms Association). 3-D/Virtual Reality Paper®, and SUPER COLOR Ink Jet Paper®. award winning business forms and systems. In 1978 he invented the "Continuous Universal Charge Card Depository Form"
In 1997 he received patent #5,636,874 on his "Document Security System"
that incorporates the use of thermochromatic "color change ink" technology. Labels and Systems Magazine's "Business Forms Hall of Fame." Since 2001, Steve has focused his efforts on Document Security. that are impossible to accurately duplicate. Rx Paper Systems for computer printing patient medical prescriptions. 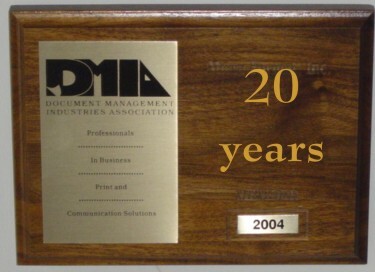 In 2006, Steve won an AWARD OF EXCELLENCE in the INNOVATION category of the 2006 Print Excellence And Knowledge (PEAK) competition sponsored by Print Solutions Magazine, published by the Document Management Industries Association (DMIA), Alexandria, Va.
Wheeling, Illinois --- Micro Format, Inc. a specialty paper manufacturer and business forms distributor announced that patent number 5,636,874 has been issued for their Temperature Sensitive Security Document. This "pro-active" security feature incorporates the use of "temperature sensitive ink" printed on "at least a portion of one of the surfaces" to identify an original document. When touched or rubbed, the portion of the Temperature Sensitive Security Document on which the ink is printed, changes color, returning within moments to it's original color state. This patent applies to checks, certificates, coupons, tickets and other "one-of-a-kind" valuable documents. Documents incorporating this unique color change capability, are impossible to accurately duplicate using a color copier or scanner. 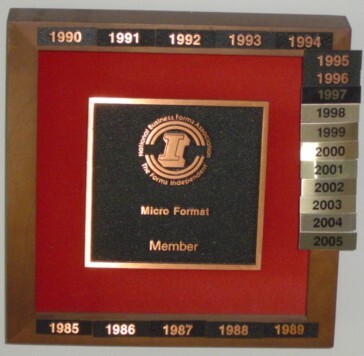 Steve Singer, President of Micro Format, indicated that his patent application has been in process for many years. Now that the patent has been issued, he is currently investigating "partnering relationships" with companies interested in using his patented Color Change Document Security feature. For additional information, contact Steve Singer at Micro Format ... 847/520-4699. "When we first applied for the patent for our Temperature Sensitive Security Document invention" Said Singer, "Our focus was on developing unique business related products. The need for a way to easily identify an original document became apparent as low cost color copiers and color scanners entered the marketplace. Having had experience working with printed color change inks, we conceived the idea of combining temperature sensitive inks with security documents. Over the past five years, everyone has become aware of the need for protecting documents from forgery. This patented process can be used to protect Negotiable Documents including Checks, Tickets, Contracts, Coupons, Gift Certificates ... any valuable document. The following abstract is from the documentation for United States Patent 5,636,874 . To prevent unauthorized duplication of important security documents, an improvement in security or protected documents is disclosed. The security document includes a substrate having top and bottom surfaces where at least one of the surfaces is adapted to carry printed copy thereon. A colored background is printed on at least a portion of one of the surfaces. such as the surface which is adapted to carry printed copy, using a temperature sensitive ink. The security document also includes copy printed on at least a portion of the one of the surfaces adapted to carry printed copy thereon. With these features of construction, the security or protected document contemplates the copy being printed by utilizing a temperature insensitive ink. A single blank is provided with four removable sections which are sub-divided by lines of weakening and fold lines. The blank is foldable along a longitudinal line and transverse line to form the four sections into a four layer product. Upon removable from the blank, the four layer product may be manipulated to expose different sub-sections and, thus, provide different pictorial representations depending upon the imaging of the sub-sections. The sub-sections are imaged in a coordinated manner to produce different scenes.